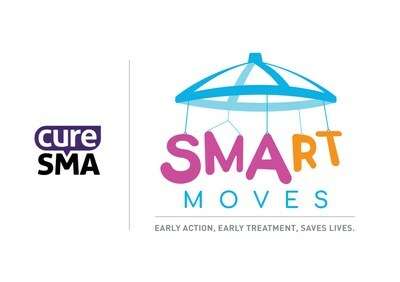 CHICAGO, Dec. 6, 2018 /PRNewswire/ -- Cure SMA has launched SMArt Moves, an educational campaign targeting parents, pediatricians and other healthcare professionals to address the signs of motor delays early. This allows infants and children diagnosed with SMA (spinal muscular atrophy) to receive life-changing—and in some cases, life-saving—treatment. "SMArt Moves is about equipping parents and healthcare professionals with the tools they need to recognize motor delays, correctly diagnose SMA and promptly get infants and young children into treatment," says Rosangel Cruz, MA, BS, Director of Research and Clinical Affairs, Cure SMA. "Early action and treatment can be truly life-changing. This swift action can result in positive results for so many with SMA. For example, a child receiving early treatment may soon be able to eat or breathe independently or reach important motor milestones previously unheard of for those with SMA." Central to the effort is a new, easy-to-use website that encourages parents to trust their instincts if they suspect a motor delay, because missed milestones can signal a serious medical condition, like SMA. At the site, parents improve their understanding of the early signs of motor delays, watch instructional videos and download a helpful checklist to share with their doctor and help address their concerns. Along with take-action resources for parents, there is a special section dedicated to healthcare professionals detailing current diagnostic criteria, educational resources and the latest treatment options and protocols. "Simply put, learning the SMA warning signs, taking early action and getting early treatment can save, and dramatically improve, children's lives," adds Cruz. "We want parents to trust their instincts, be informed and empowered to address developmental concerns with their pediatrician." Cure SMA introduced SMArt Moves during its symposium at the annual American Academy of Pediatrics Conference in Orlando, and is generously funded by the members of the Cure SMA Industry Collaboration. SMA is a disease that robs people of physical strength by affecting the motor nerve cells in the spinal cord, taking away the ability to walk, eat, or breathe. Approximately 1 in 11,000 babies will be born with SMA, and about 1 in every 50 Americans is a genetic carrier, regardless of race or gender. Currently, SMA is the leading genetic cause of death for infants. However, the early diagnosis and treatment promoted by SMArt Moves aims to significantly improve upon that dismal statistic, and ultimately, save lives. Cure SMA is dedicated to the treatment and cure of spinal muscular atrophy (SMA), the number one genetic cause of death for infants. We fund groundbreaking research and provide families the support they need for today. Learn more at www.curesma.org.